The Emir of Qatar heard how Moorfields and Imperial are working with DeepMind, a leading artificial intelligence company. The Emir of Qatar Sheikh Tamim Bin Hamad Al Thani visited London and met with Pearse Keane, consultant ophthalmologist at Moorfields Private, to discuss the latest health innovations. 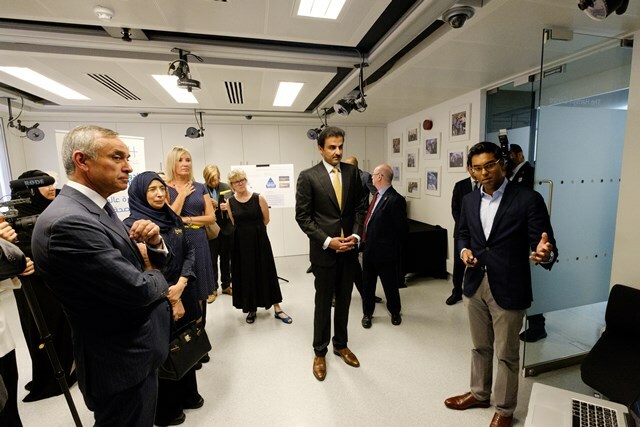 The Emir of Qatar with members of his cabinet including Her Excellency Dr Hanan Al Kuwari, the minister of public health, toured Imperial College London where researchers demonstrated the latest technology, including surgical robots. Pearse Keane joined a round-table discussion about some of the biggest health challenges that are faced by Qatar and the UK, including the dramatic increase in the prevalence of eye disease which could lead to a threefold increase in blindness globally by 2050. Research led by Pearse at Moorfields is assessing how new technologies such as artificial intelligence can be applied to healthcare to solve some of these big challenges and improve patient care. Pearse was joined at the roundtable by senior figures leading on public health initiatives including Dame Sally Davies, chief medical officer for England, and Lord Darzi, professor of surgery at Imperial College London. Moorfields has strong links in the Middle-East and has eye centres in Dubai and Abu-Dhabi. The visit provided an opportunity to highlight Qatar’s efforts to tackle global eye disease, including the philanthropic support Qatar gives to Orbis, the non-profit organisation dedicated to saving sight worldwide. It was also an excellent opportunity to showcase the cutting edge work being undertaken at Moorfields.